A number of the affected Region Five security guards. Frustration among security guards employed by a private security firm to provide security for Government buildings throughout Region Five continues to grow, and they have become desperate in their efforts to get the authorities to honour their obligations, and to pay their workers. Integrated Security Services, towards the end of last year, took over from Home Safe Security Services, as the firm contracted by Government to provide security service for government buildings throughout Region Five, among those buildings, the RDC Office, health centres, government schools. Workers were told that they will be paid on the second Friday of each month, but so far they have not received any payment in January, and none in February. Workers having organised themselves to speak with a unified voice, and have been making efforts to engage the relevant authorities in their efforts to have the security firm pay the outstanding wages, but so far, their efforts have yielded no fruits. There have been empty promises, and the desperate workers, on February 22, put their case to Regional Chairman Vickchand Ramphal, and Member of Parliament Harry Gill, who promised to discuss the matter with the relevant authorities, and to report to the workers as early as possible. Approximately 80 workers turned up for the 3 o’clock meeting which was held at Number Five Village, West Coast Berbice. The workers at a previously held meeting, listed a number of issues affecting them, none of which has been addressed so far. 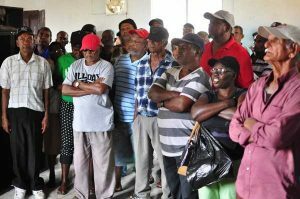 Meanwhile, security guards in Region Six, employed by the same embattled security company have been reported in another section of the press as have been having similar issues, and the matter is reported to have got the attention of a Government Minister who had issued instructions to various officers. However, the workers are claiming that even if there has been any movement on the issues affecting them, such movement is not evident to them, since the very first step necessary is for workers to be paid.